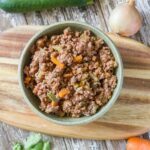 Today’s recipe, Beef & Vegetable Mince is a recipe that I have been making for years and years and years. I used to make it as a bolognese sauce for my pasta dishes or lasagne, but I typically made it with less vegetables. I have been sneaking more and more veggies in over time, and I while the flavour is just as good, the nutritional value is even better! I love it as It is a fairly inexpensive dish to make and a batch of this can last a few days – so its a great one if you are trying to stick to a food budget. Add coconut oil to a large sauce pan on medium heat. Add onion and garlic and cook until soft, approximately 5 minutes. Add carrot, celery & zucchini and cook for 5 minutes., next add the mushrooms and cook for 2-3 minutes, until they soften. Then add the mince and crumble with a fork or wooden spoon until there are no clumps remaining. Stir through your chosen herb & spice mix and cook until the mince has browned approximately 10 minutes. Finally, add the canned tomato and tomato paste and cook on low for 10 – 30 minutes (depending on how much time you have, the longer you cook it the more the mince will absorb the flavours). Then it is ready to eat as is, or ready to add to another recipe.